The mystery of the famous UFO 90 years elucidated: "A hoax"
The photo had been around the world and was analyzed by the most eminent specialists. None had solved the mystery of the UFO and Breakfast Rechain became the emblem of the Belgian UFO wave of the 90s. Eighteen years later, the author unveils the cliché. The end of 1989 and the 90's were marked by a mysterious UFO flap in Belgium. Appearances never understood. 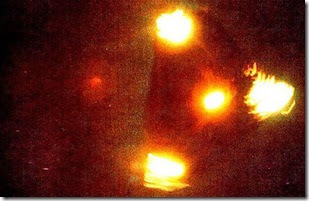 Emblem of the phenomenon: a picture of a triangular UFO with three lights, one in each corner, taken April 4, 1990 in Petit Rechain, near Verviers, by a Patrick, a young turner-fitter of 20 years. The slide will travel around the world, will be discussed by leading experts and up to the Belgian Royal Military Academy.